Weekend Reads continues (read part one here) …a round-up of articles and words that I’ve come across in relation to societal, governmental, commercial/economic and cultural aspects of China and Chinese contemporary visual culture…this time with new books and publications too and also a few upcoming events that are happening in the UK that might be worth attending. Get a cup of tea, or iced drink, hopefully in some UK summer sun and get reading. I’m spending this weekend in a cabin on a beach on the North Wales coast. Me, manaXi, the sea, the mountains and the power of my feet. Speak to you all next week! Interest in China is constantly growing. Debate about China’s rise and development is taking place on a global scale. Participants in the debate have expertise coming from many different backgrounds. One of the challenges for university-based scholars and students of China is how to communicate their specific expertise and make it accessible to wider audiences. Questioning and reflecting on the circumstances that inform recurrent international exhibitions, Keith Whittle, researcher and Japan Foundation Fellow, will explore and highlight some key strands of a number of periodic exhibitions through specific examples informed by research in Japan and the UK. Followed by a panel discussion to further examine issues related to the projects, Whittle will be joined by two internationally recognised curators, Yuko Hasegawa and Lewis Biggs, both responsible for curating a number of major exhibitions, including in Sharjah, United Arab Emirates and Aichi, Japan respectively, Mark Rappolt, Editor at ArtReview, and Koki Tanaka representative artist, Japan Pavilion, 55th International Art Exhibition, Venice Biennale. While increasing global attention on art from China is focused mainly on the extraordinary prices pieces command at auction, French collectors, Sylvain and Dominique Levy, founders of the DSL Collection of Chinese Contemporary Art, have instead enjoyed a personal discovery engaging in the study and promotion of their collection, ranging from sculpture, to paintings, to photography and video art. Their approach to collecting is on the philosophy of acquisition and the utilisation of new technologies. Sylvain believes that the information revolution spearheaded by the real-time of the Internet and the iPad can be an interesting alternative space for art. Sylvain Levy will discuss some of the challenges in building their collection, and will be sharing the details of a number of the works in their latest digital version, which presents 350 artworks from 200 contemporary artists from China. Is the West worried about sharing world resources on a per capita basis, the increasing innovativity of China or how China will behave if it takes on or shares with the USA the role of the world’s policeman? Kerry will be basing his talk on a series of essays written between 2006-2013, Dr Kerry Brown, formerly Associate Fellow at Chatham House and author of several books on China, will talk about how the cultural, political and economic dynamics at play in China as it has become richer, more powerful, more prominent. 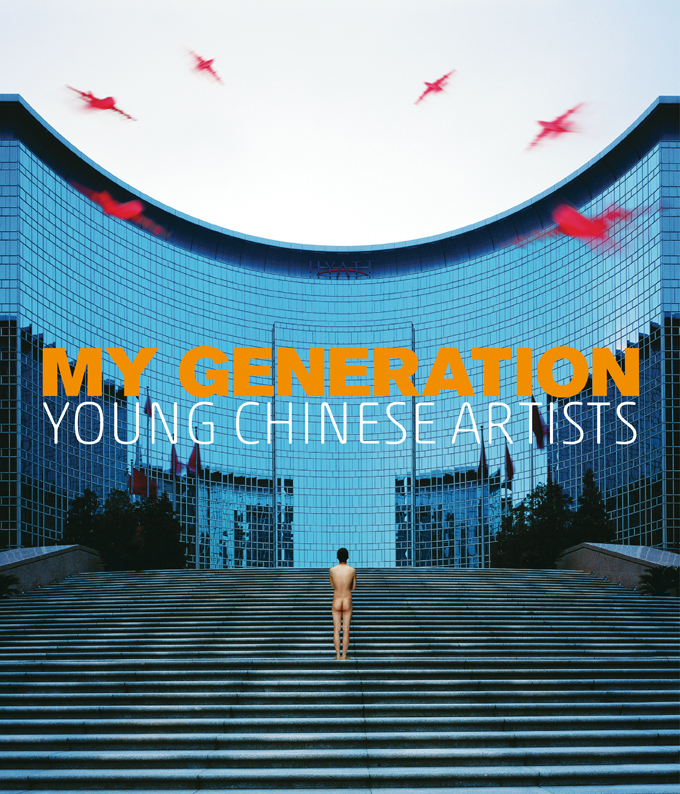 My Generation: Young Chinese Artists looks at a whole new generation of artists that has emerged in China since 2000. All of these artists were born after 1976 and the end of the Cultural Revolution era; and all of them have been exposed to international art movements and increasingly liberalized education in a society undergoing rapid industrialization and globalization. Their artworks can be characterized as “post-Chinese”, free of stereotypes and icons, and liberated from an East-West dichotomy. For years after the return of Hong Kong to Chinese sovereignty in 1997, China’s leaders surprised the world by adhering scrupulously to Hong Kong’s unusual political set-up of “one country, two systems”. Under the terms of the handover, Hong Kong was to retain a high degree of autonomy for 50 years, an ingenious solution for reintegration of a former colony. In recent years, however, party leaders in Beijing have become less respectful of that system, and that is stirring up resentment. China’s ghost cities aren’t going away. Even as Beijing wants local governments to move away from GDP targeting and is more focused on developing social housing, wasteful construction still plagues China. A report from CLSA’s Nicole Wong, cited by The Wall Street Journal, found that the problem lies in the excess supply in China’s third-tier cities. Vacancy rates for homes constructed in the past five years stand at 15% but are projected to rise over 20% in 2016-17, according to Wong. 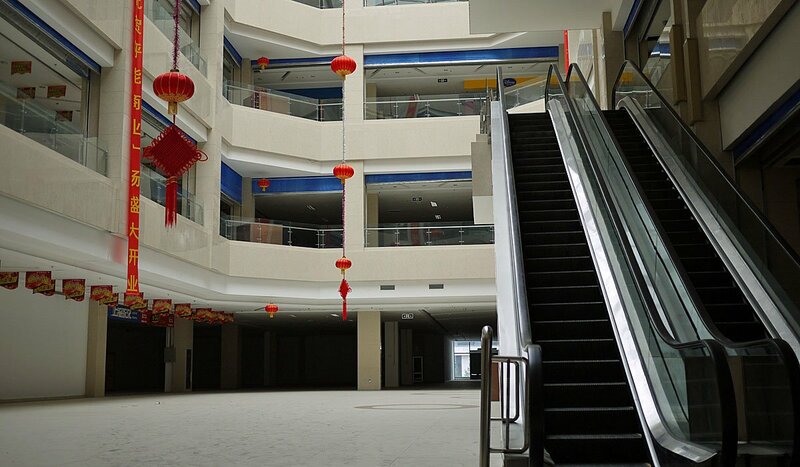 Empty shopping mall in Ordos, China. Image courtesy of Business Insider. The V&A Museum will collaborate with developer China Merchants Group on content for the Shekou Museum in Shenzhen designed by Tokyo architect Fumihiko Maki. The Japanese architect, who was awarded the Pritzker Prize in 1993, unveiled models of the museum to coincide with the formal signing of an agreement between the V&A and the Chinese development company. Art Zip have published a 7 page article on the Alternative Art College and an interview with Paul Stewart, this is part of an issue dedicated to looking into alternative learning and issues in HE in both the UK and China. Beijing artist Yin Xiuzhen has brought her time-based artwork, Washing River, to Tasmania, and with it a chance to absolve viewers of environmental crimes. Continued “From the Issue of Art to the Issue of Position: The Echoes of Socialist Realism, Part I”. In the 1940s, as Socialist Realism took form and began to emerge following the establishment of the Communist Party’s leading position in China, its language drew from the realism that had spread throughout the Chinese mainland in the 1920s and ’30s. After 1949, Mao started to develop a cultural policy and released several statements on the matter; realism gradually transformed into revolutionary realism. Its incorporation into the revolutionary romanticism of the time meant that it ceased to be a realism that was naturalist in tendency. Rather, it gained spiritual connotations, and provided a blueprint for the political vision of socialism. It’s easy to think Chinese political art stops at Ai Weiwei, the embattled provocateur who is arguably the art world’s most famous living figure. In fact, a small circle of Chinese artists routinely court danger with their work, not to mention derision from mainstream stars enjoying the market’s love affair with Asian art, who consider anti-party stances “passé.” There’s nothing banal about the punishment dissidents face though. According to the Chinese Human Rights Defenders, an international grassroots coalition, more than 100 noted activists have been taken into custody in the lead-up to last week, when the world outside of mainland China noted the 25th anniversary of the crackdown at Tiananmen Square. Some of those arrested were soldiers themselves, turned artists from the horrors they’ve seen. Most exhibited their work in private, but were sniffed out anyhow. Below, a look at those who dare to aggravate the state. A new artistic generation has appeared in China and they have something new and revealing to say about their world and their lives! My Generation: Young Chinese Artists, a museum exhibition featuring 27 emerging artists has just opened in Florida, at two venues: the Tampa Art Museum and the Museum of Fine Arts, St. Petersburg. The show looks at the new generation of artists who have emerged in mainland China since 2000, a period marked by increased openness to the West and greater experimentation. It is curated by Barbara Pollack, one of the foremost authorities on contemporary Chinese art, who since the late 1990s has written extensively on the subject and is the author of The Wild, Wild East: An American Art Critic’s Adventures in China (Blue Kingfisher Ltd., 2010). The Chinese artist Ai Weiwei is helping to launch a website dedicated to digital art. The £8.6m project – called The Space – will commission and showcase new art for audiences around the world. Ai has given the names of victims of the 2008 Sichuan earthquake in China to a 24-hour launch event taking place at London’s Tate Modern this weekend. He hopes the names will be used to create “a meaningful piece of digital art”. Why there are more and more works by Asian artists at the fair, many of them on Western galleries’ stands. The VIPs who came to the opening of Art Basel yesterday found more works by Asian artists than ever before—and many have been strategically placed to capture the interest of collectors. Unlike previous editions of the fair, where works by artists from the Far East were limited to those on view with the emerging Asian galleries on the fair’s first floor and a few specialists on the ground floor, it now seems that nearly every gallery has an Asian work to show. This is despite the fact that there are ten fewer galleries from Asia at the fair (21 in total) compared with last year. Christina Yu Yu made a great leap eastward in 1998 from her native China to a college campus in Massachusetts. This summer she will make a somewhat smaller one: She’s leaving the Los Angeles County Museum of Art, where she has been a curator of Chinese and Korean art since 2011, to become director of the USC Pacific Asia Museum in Pasadena. When she starts her job Aug. 1, Yu Yu will be the first director of the Pacific Asia Museum’s new era under USC, not counting interim director Selma Holo, who has run two museums since December and will resume focusing on her longtime job as director of the on-campus Fisher Museum of Art. The Hirshhorn Museum and Sculpture Garden has named Melissa Chiu, veteran director and senior vice president for global arts and cultural programs for the Asia Society Museum in New York, as its new director. The Australian-born Chiu, 42, who will assume the position Sept. 29, succeeds former director Richard Koshalek, whose tenure was marked by controversy over funding for his signature Seasonal Inflatable Structure proposal. He announced his resignation a year ago. The Chinese artist Ai Weiwei has struck back using social media against what he sees as self-censorship when his name was omitted from a list of participating artists for a show at the Ullens Centre of Contemporary Art (UCCA) in Beijing. In protest, the activist-artist has removed his work from the exhibition, organised to celebrate the work of the late curator Hans van Dijk, a champion of contemporary Chinese artists. In the last month, in two separate cities, I was involved in events related to the rewriting of the history of Chinese contemporary art. In Shanghai, two of my works, “Stool” and “Sunflower Seeds,” were included in an exhibition commemorating the 15th year of the Chinese Contemporary Art Award. A half-hour before the show opened, local officials had my name erased from the exhibition’s wall text and barred the artworks from being displayed. A few weeks later in Beijing, under similar pressure, the Ullens Center for Contemporary Art excised my name from publicity information about an upcoming show honoring my late friend Hans van Dijk, with whom I had founded one of the first experimental art spaces in China. I decided to withdraw all my pieces from the exhibition in protest. Sun Xun’s meticulously crafted ink-and-brush animated “What Happened In Past Dragon Year” riffs on traditional Chinese iconography to create a gently subversive work that uses broken translations of the original language throughout. “It started with a cover I was designing for an economics magazine. The brief was an assessment of the Year of the Dragon through the eyes of an artist,” says the Beijing video artist. “It works as both a reflection and a prediction.” The piece is currently screening at the Edouard Malingue Gallery as part of Brave New World: named after Huxley’s dystopian novel, his exhibition follows Sun’s inclusion in the Met’s critically acclaimed survey of Chinese artists Ink Art and his solo show at London’s Hayward Gallery earlier this year.